There’s a conversation that’s been going on, here and there, across the blogosphere, since Danny Boyle blew our minds and melted our cynical hearts at the Olympics Opening Ceremony. It’s not a new conversation for most of us, but it’s suddenly become more intense, more personal. We – those of us who are having this conversation now, rather tentatively, almost apologetically – are generally of the left; our disposition is likely to be cosmopolitan and internationalist, and we’re likely to be sharply critical of current and previous government policies at home and abroad. We’re highly unlikely to have celebrated the recent royal wedding, or the Jubilee, or to own or wear any clothing featuring our national flag. We probably agree that the national anthem is a dirge even if we disagree about what – if anything – should replace it. But we found ourselves recently coming over, as Mike Press put it, ‘a little bit Continental, even almost disarmingly American’, in the way we responded to that opening ceremony and the display of sporting excellence that followed. Steve Sarson echoed this – ‘It was like I’d turned into an American, or something’. Blake Morrison in the Independent was part of this too: ‘I didn’t expect to feel excited. And as the opening ceremony grew closer, and the stories of mismanagement multiplied, I feared the worst. I was wrong. Most of us were wrong. The last two weeks have been amazing. I’m embarrassed to admit how many times my eyes have welled up. And even more embarrassed that the cause has usually been a British medal’. So our conversation has been about what happened to us and what it means for our perception of who we are. There are two main threads to that, I think. One is about the mood that prevailed – summed up in the opening ceremony – replacing our ‘seemingly eternal cynicism and negativity’ with the sensation that we are better than that, that we can be warm and open and welcoming, joyous and positive. The other is about that tug of pride that we felt in the depiction of our ‘Isles of Wonder’, and in the performance of ‘our’ medallists. The first is something we want to celebrate and nurture, the second, as another friend of mine said, is ‘complicated’. It’s not a new conversation. 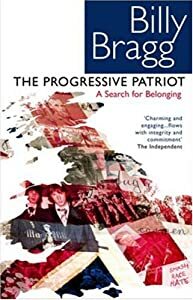 Billy Bragg’s book The Progressive Patriot is an eclectic invocation of the history, literature and music of his homeland – one feels Danny Boyle must have read it – and a response to the BNP’s gain of a dozen seats on Barking & Dagenham Council in the wake of the July 2005 London bombings. It’s an attempt to identify the narrative that explains ‘how we all came to be here together in this place, and how successive generations of those who were initially excluded from society came to feel that this was where they belonged … to reconcile patriotism with the radical tradition’. I agree. With both of them. And yet, and yet… I feel that tug of love without embarrassment or complications for another country, because of the place it holds in my childhood memories and because being there shaped how I see the world. I’ve put Ghana’s flag on my desktop and my Facebook profile – I would never dream of doing that with the Union Jack. I’d fail Tebbitt’s notorious cricket test if the England football team were to come up against the Black Stars. So why is it OK for me to be gung-ho about Ghana, and not about the country where I was born, where I’ve lived the majority of my life, where my children have been born and raised? What do we mean when we talk about pride? What do we mean, come to that, when we talk about Britain? Kenan Malik‘s response to the Olympics was sceptical. He asked ‘What is the Britain in which we are supposed to have pride? The Britain of immigration and diversity, a diversity celebrated in Danny Boyle’s Olympic opening ceremony and that has resulted in the gold medals of Jessica Ennis, Mo Farah, Nicola Adams and countless others? Or the Britain that is suspicious of immigrants and immigration, and whose politicians continually seek to limit it and to preserve ‘British jobs for British workers’? The Britain that went all out to stage one of the best Olympic Games in recent memory? Or the Britain of austerity and public spending cuts? The Britain of the Levellers, the Pankhursts and Red Clydeside? Or the Britain of Knox, Rhodes and Rothermere?’ Easy answers spring to mind, but he’s right, my Britain may not be your Britain. We could just say, well, we got a bit carried away there, but it’s ok now, we’re ourselves again. But with the Paralympics just around the corner, what if we get a bit carried away all over again? What if we actually rather like it? I think we need to talk. This entry was posted on August 23, 2012, 12:54 pm and is filed under Events, Patriotism, Personal. You can follow any responses to this entry through RSS 2.0. You can leave a response, or trackback from your own site. First of all, wonderfully thoughtful. Second of all, I do think this is a conversation Britain needs to have. I stand by my early observations of England in particular. Ya’ll are having a bit of an identify crisis. You are no longer The Empire, so who the heck are you and (more importantly) who do you want to be? I believe Patriotism gets a bad rap and I have to say I disagree with my fellow Yankee, though I respect her Dixie Chickness. Patriotism is important. It reflects a kind of meta sense of self-worth and self-respect. Where you grow up is a part of you and I think everyone has to come to terms with it. So sayeth the Genyoooiiine American.